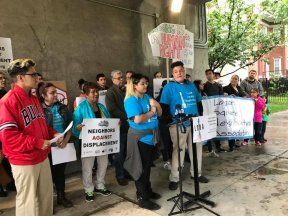 Heavy rains could not deter residents of the Humboldt Park, Hermosa, and Logan Square communities from holding a press conference at the 606 Trail Tuesday afternoon to highlight a new ordinance designed to keep longtime residents safe from displacement. Backed by Logan Square Neighborhood Association (LSNA), LUCHA, Center for Changing Lives, to name a few, Alderman Roberto Maldonado and Alderman Moreno introduced the “606 Residential Area Preservation Ordinance,” an ordinance created to preserve affordable housing for local families along the 606 trail. The “606 Residential Area Preservation Ordinance” creates a pilot district along the trail that requires some developers to pay a fee if they want to demolish a building and replace it with luxury housing. 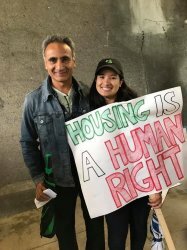 The fees collected will be managed by a local board of trustees made up of social service agencies, local residents and elected officials who will oversee the investments to preserve affordable housing for local families along the 606. According to research published last November in the Institute for Housing Studies at DePaul University home prices near 606 West surge by 48.2 since the project broke ground. Since then, many are mourning the rapid displacement of families along the trail. 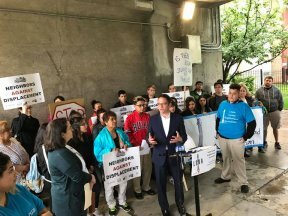 Following Tuesday afternoon’s press conference, LSNA, Ald. Moreno, and others spoke out at a press conference at City Hall to further discuss the new ordinance. “The basic premise is that the community that supported and helped build the support for the 606 that we all love and enjoy, should not have to move based on their success. These residents, longtime residents deserve access to this, not just the wealthy, but all Chicagoans. We hope this ordinance will do just that. We hope this ordinance will encourage developers to build affordable housing. I am proud, along with my peers, to fight for the win on this ordinance…it is for our neighborhood,” said Ald. Moreno. 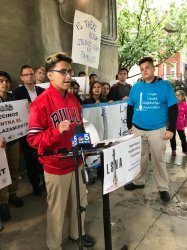 “LSNA strongly supports any initiative that gives community oversight over the rapid development taking place along the 606, especially an ordinance like this that will help families live in the community they love and prevent the demolition of affordable housing,” said Brian Perea, a youth mentor with LSNA. Founded in 1962, LSNA is a nonprofit, multi-issue, grassroots community organization serving the multi-ethnic communities of Logan Square, Avondale, Hermosa and the Lathrop Homes area of Chicago. LSNA is committed to empowering and maintaining these communities as diverse, safe, and affordable neighborhoods in which to live, work, learn and grow.